German print media like Süddeutsche Zeitung and most recently Spiegel [1,2] have accumulated quite a history for characterizing bloggers and Social Media as incompetent, socially irrelevant, unpolitical, self-satisfied, self-referential or even lacking a clear identity, as if digital life would simply vanish as a consequence of their writing. In the face of declining sales numbers, German established media reactions have become increasingly scornful with regard to bloggers in that they teach their increasingly elderly readership to be afraid of bad things that come with the internet – makes for ideal preconditions for a warm relationship. Amongst deserving more public recognition are Open Access research journals since they abest ccount for the internet as the emergent knowlege world I blogged about earlier. Though growth of OA research journals has been significant, OA still has yet to compete with the non OA journal limited to subscribers and libraries willing and able to pay. The USA is expectedly in a leading position with 773 OA journals, followed by Brazil with 333 journals, United Kingdom with 310, Spain with 203, Germany with 138 and Japan with 107 journals (full list here). With only 67 of the registered 3530 journals, sociology is far from the most active disciplines. Three hopefuls for an emerging online sociology world are Forum Qualitative Sozialforschung (German, English & Spanish), Econsoc Newsletter (English) and STI-Studies. Let me recommend the current issue of STI, „the first internationally oriented, reviewed online journal for the German speaking STI community“ that devotes two of four articles to internet related topics. All four articles are fascinating literature for today, and STI even invites readers to engage in a open dialogue because it introduces a comments form on their website. My hope is that open access journals like this one will spread much further and enable scientists, teachers, students, journalists and a broader public to search for peer reviewed scientific information online. The first of four articles by Frank Kleemann, G. Günter Voss and Kerstin Rieder introduces a work and business perspective of Web 2.0. In „Un(der)paid Innovators: The commercial Utilization of consumer work through crowdsourcing„. Web 2.0 technology has enabled companies to outsource time consuming work activities to the paying customer or – more broadly – consumer and is evidence of a shift in relations between firms and their customers. We are witnessing the emergence of a new consumer type: the „working consumer“. In the conventional role, consumers used to be the passive „kings“ to be waited upon. Recently, consumers have become more like co-workers who take over specific parts of a production process, whereby both the process and the result remain under the control of a commercial enterprise or provider. The article seeks to develop a more precise definition of crowdsourcing and to differentiate crowdsourcing from peripheral related phenomina such as the open source movement. In its conclusion, the article develops the argument that the consumer works as unpaid employee or innovator and discusses potential consequences of crowdsourcing from a work and industrial sociology perspective [pdf] [comment]. In his article „Nanotechnology – an empty signifier à venier? A delineation of a techno-socio-economical innovation strategy“ Joscha Wullweber gives a critical account of the Nano-hype. Nanotechnology is perceived as a key technology of the 21st century. As a result, nano plays an important role in government policies devoted to technology. Nanotechnology is supposedly appealing for many actors, since it is expected to both produce entirely new materials and revolutionize production processes in various industries. Approaching the ‘nano-hype’ from a discourse-theoretical perspective, Wullweber aims to show that nanotechnology is an empty signifier rather than a developed technology. This empty signifier provides the basis for an encompassing socio-economic project that is kept together only by the signifier itself. This “innovation project” creates a link between nanotechnology and the future of the industrialised states. It aims, above others, at their reconstruction along competitive criteria as ‘competition states’. The author discusses nanotechnology policies within a discursive field of political and economic interests and strategies and highlights the importance of hegemonic struggles for the construction of a nanotech market and nanotech as a political reality [pdf] [comment]. Finally, Niels Taubert examines decision making and decision implementation processes in free/ open source software production in his article „Balancing Requirements of decision making and action: decision making and Implementation in Free/Open Source Software Projects„. Referring to Nils Brunsson, the author sets out with antagonistic requirements of (rational) decision-making and action: On the one hand, rationality of decision-making implies extensive evaluation of alternatives and arguments that can lead to an uncertainty as to which of the alternative will be chosen. On the other hand, a good basis for collective action is established when uncertainty is reduced and consistent expectations exist as to what kind of action will be performed. Corroborating on an empirical analysis of a decision-making process and interviews conducted with FOSS developers, the author identifies three mechanisms of bringing a controversial discussion to an end: (1) rational consensus, ending a decision making process by virtue of an argument leading to a well-funded decision (2) seeking a compromise which takes into account previously discussed suggestionsm, or (3) moving from collective decision making to individual action – a last conceivable solution to not let a project fail alltogether. Taubert’s paper concludes with an evaluation to what extent each of these mechanisms serves the requirements for rational decision-making and action. [pdf] [comment]. What OA journals do you wish to recommend for me? Am Beginn meiner Weblog-Aktivitäten hatte ich gelegentlich Diskussionen mit lieben Menschen in meiner vertrauten Umgebung oder auch mit Bekannten, die das Internet zunächst etwas abfällig als banal, trivial, redundant charakterisierten. Dann kommt man ins Gespräch und nach einigen differenzierteren Äußerungen – manchmal auch, wenn etwas Zeit verging – fiel mir erstaunlicher Wandel auf. Dieselben Sprecher äußerten, das Internet stelle aufgrund seiner Komplexität eine Überforderung dar. Ein erfreulicher Wandel, denn die Sprecher zeigten bei näherem Hinsehen Bereitschaft, das Internet in seiner ungeheurlichen Größe, Komplexität und Dynamik ernst zu nehmen, und ich denke, die Bereitschaft wird noch weiter steigen. Eine ähnliche Entwicklung ist auch in der Soziologie beobachtbar. Auch hier folgte auf anfängliche abfällige Bemerkungen über Qualitätsdefizite, Mangel an Professionalismus und dergleichen eine Entdeckung des Internet als sozial bedeutsamer Forschungsgegenstand, dem mit einzelnen speziellen Soziologien nur bedingt beizukommen ist. Gewiss lief diese Entwicklung parallel zu Wachstum, technischer Entwicklung und neuen Nutzungsformen des Internet selbst, aber auch der dynamischen Entwicklung der interdisziplinären Online-Forschung. Mittlerweile liegen viele spannende Forschungsbeiträge aus den Perspektiven der Technik-, Medien- und Kommunikations- und Wissenssoziologie vor, und es müsste auch Forschung aus Wirtschafts-, Organisations-, Arbeitssoziologie und vielen anderen Teildisziplinen geben (da ist aber m.W. viel in Arbeit :-)). 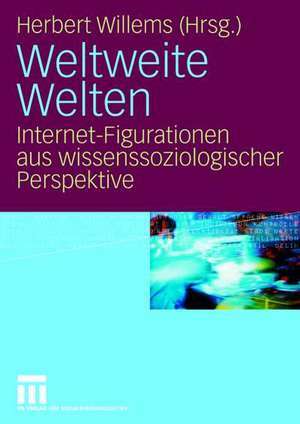 Der von Prof. Herbert Willems an der Universität Gießen herausgegebene Sammelband „Weltweite Welten – Internet-Figurationen aus wissenssoziologischer Perspektive“ ist nun beim VS-Verlag erschienen. Der Band ist ein weiterer Beleg dafür, dass sich Soziologen dem Internet aus den Perspektiven vieler spezieller Soziologien widmen – Die Beiträge nehmen die Realitäten des Social Web aus der Perspektive der Wissenssoziologie auf’s Korn. Die Verbreitung des Internet bringt einen bedeutsamen Wandel der Handlungs- und Erfahrungsbedingungen, aber auch der subjektiven Wirklichkeit und Identität mit sich. Damit ändern sich auch Diskurse und soziale Beziehungen, Erlebnis-, Deutungs- und Handlungsmuster, Habitus, Stile, Kapitalformen, Handlungsskripten, Emotionen, Routinen, Phänomene und Phänomenklassen, wie sie die Kultur- und Wissenssoziologie untersucht. Auf einer Mikroebene wissenssoziologischer Analyse stehen Beiträge, welche Praxis ausgehend von lebensweltlich verankterten Wissensformen untersuchen und Glaubwürdigkeit anders herstellen als unter den Bedingungen einer Face-to-Face-Interaktion oder herkömmlicher Medien wie Print, Rundfunk und Fernsehen. Dazu gehören beispielsweise Praktiken der Selbst-Darstellung, des Tauschs und Verkaufs, der Wissensorganisation, der erotischen Kontaktanbahnung und des Spiels im Netz. Es liegt auf der Hand, dass elementare lebensweltliche und massenmediale Handlungskontexte, Sinnstrukturen und Handlungsskripte unter den Bedingungen des Internet neue Formen und Inhalte annehmen, ohne dass das ‚Alte‘ einfach verschwindet. Eher auf einer Makroebene wissenssoziologischer Analyse sind Beiträge angesiedelt, die der veränderten Rolle gewidmet sind, die das Internet in verschiedenen gesellschaftlichen Feldern oder Subsystemen spielt oder gespielt hat – z.B. Vermarktlichung oder Demokratisierung. Als Gemeinsamkeit aller Beiträge hebt der Herbert Willems eine gleiche Polung hervor, denn alle Autoren des Bandes denken – jeweils in Bezug auf Wissen – in Kategorien der Beziehung, der Relationalität und der ‚vernetzten‘ Praxis. Ernst von Kardorff gibt mit „Virtuelle Netzwerke – neue Formen der Kommunikation und Vergesellschaftung?“ eine breite Einführung in das Thema der computervermittelten Kommunikation im globalen Cyberspace und die sozial-kulturellen Vernetzungsoptionen. So erweisen sich die viel diskutierten Identitätsdarstellungen und -konstruktionen im Internet als Antwort auf formale Grundbedingungen menschlicher Kommunikation und normative Anforderungen einer Inszenierungsgesellschaft. Viel Diskussionsstoff dürfte Kardorffs Zusammenstellung der durch das Internet erzeugten methodischen Herausforderungen an die empirische Sozialforschung stellen. „Willkommen in der Wirklichkeit!“, begrüßt Tillmann Sutter die Leser und trifft mit seiner medien- und techniksoziologischen Betrachtung meine Frequenz. Sutter stellt heraus, dass die hoch gesteckten Erwartungen an Interaktivität der Internetkommunikation in den vergangenen Jahren einer gewissen Normalität gewichen sind. Interaktivität charakterisiert eine neue Form des Mediums Internet, das anders als Print, Rundfunk und Fernsehen vielfältige Rückmelde- und Gestaltungsmöglichkeiten für die Nutzer eröffnet. Auffällig bei diesen Rückmelde- und Gestaltungsmöglichkeiten ist die enge Orientierung an der Face-to-Face-Kommunikation im Alltag. Damit stellt sich die Frage nach Gemeinsamkeiten und Unterschieden von Internetkommunikation und der „natürlichen“ Face-to-Face-Kommunikation zwischen Menschen. Sutter hebt die Anthromorphisierung der Internettechnologie und Dezentralisierung der Social Media hervor: der PC als Interaktionspartner, die Netzkommunikation als Raum der Gemeinschaftsbildung, die Welt als vernetztes „Global Village“ , die Einbettung der Online-Kommunikation in soziale Netzwerke der Offline-Welt. Der Mythos der „Künstlichen Kommunikation“ weicht anthropomorphen Deutungsmustern. Generalisierung und Personalisierung (im Sinne des persönlichen Gebrauchs) der Kommunikation sind Merkmale der Abkopplung der Komunikationsform von sozialer Interaktion. Die hauptsächliche Funktion der traditionellen Massenmedien besteht in der Generalisierung der Kommunikation, d.h. alle haben Zugang zu den gleichen Texten bzw. Medienangeboten. Das Neue der Netzwerkkommunikation durchbricht diese Generalisierung, d.h. an die Stelle der generalisierten treten die individuellen und veränderbaren Texte. (…) Personalisierung wird zum Merkmal der Interaktivität neuer Kommunikationsformen, die eine individuelle Gestaltbarkeit der Texte erlauben. S. 68. „Virtualität, Identität und Gemeinschaft – Reisende im Netz“ ist eines inspirierenden Beitrags von Christina Schachtner, die Menschen, die viel im Internet unterwegs sind mit der Frage nach der subjektiven Bedeutung von Virtualität konfrontiert hat und handschriftliche Zeichnungen der Interviewpartner eingebunden hat. Der Apokalypse des Zerfall des Sozialen und der Demontage des Subjekts setzt Schachter den Aufbruch in die unendlichen Weiten des Internet, neue dynamische Lebensformen entgegen. Bei Robert Musil findet sich eine Idee, die vom Format von Persönlichkeiten ausgeht, die Neues hervorbringen. Der Möglichkeitsmensch sei es, der den neuen Möglichkeiten ihren Sinn gebe und sie so zum Leben erwecke. Das Netz knüpfe also an die die Möglichkeit eines glücklichen Lebens als Wechselspiel von Aufbruch und Ankommen an. In „Vom Brockhaus zum World Wide Wiki“ greift Hans Geser am Beispiel von Wikipedia versus Brockhaus und Enzyklopedia Britannica die asymmetrische Konkurrenz zwischen Open Source Netzwerken und Unternehmen bei der Wissensproduktion auf. Während bei der herkömmlichen Enzyklopädie der Autor als unverwechselbarer Genius im Zentrum steht und professionelle Herausgeber eine Gate-Keeping Funktion zur Sicherung der Qualität ausüben, wird die Wiki-Technologie bei der Online-Enzyklopädie Wikipedia als Instrument der kollektiven kooperativen Schriftproduktion eingesetzt. Geser unterscheidet zwei Modi der Textproduktion: Programme, die diskursive interpersonelle Kommunikationsprogramme unterstützen, und Programme, die synthetische Kommunikationsprozesse unterstützen, wie sie für die Erarbeitung von konvergenten Positionen der Wahrheits- und Entscheidungsfindung erforderlich sind. Wikipedia verbindet beide Arten von Programmen miteinander. Vergleicht man ein Wiki mit einer Betonwand, bekommt jeder Teilnehmer ein Farbspray an die Hand, um Neues hinzuzufügen, andererseits aber auch ein Entfernungsmittel für vergangene Farbauftragungen. Das enzyklopädische Projekt Wikipedia mit seinen eigentümlichen innovativen Potenzialen, Grenzen und Risiken der wikibasierten Wissensproduktion hat seit dem Start 2001 einen raketenhaften Aufstieg und unhaufhaltsamen Siegeszug erlebt. Zugleich stellt die Wikipedia neue Herausforderungen an eine empirische wissenssoziologische Erforschung des Internet. Die Beiträge „Formationen und Transformationen der Selbstinszenierung“ von Herbert Willems und Sebastian Pranz und „Professionalisierungs- und Inszenierungstendenzen in der beruflichen Netzwerkkommunikation“ von Michaela Goll beleuchten Aspekte der Selbstthematisierung, Selbstdarstellung, Selbstinszenierung und Identität. Willems/Pranz richten ihr Augenmerk auf Institutionen der Selbstinszenierung wie z.B. Beichte, Psychoanalyse, Gruppentherapie, Selbsterfahrungsgruppe im Vergleich zum Internet-Chat. Mit dem Inernet hat sich ein qualitativ neuer Raum und ein neues Ensemble der Möglichkeiten, Modi und Stilen der Selbstthematisierung entwickelt, bei dem das Individuum zum eigenen Image-Generator wird und bewusst und gezielt seine persönliche Identität, Sozialbeziehungen und Reputation „managt“, sich dabei bis zu einem gewissen Grad auch selbst neu erfindet. Michaela Goll diskutiert die Professionalisierungs- und Inszenierungsstrategien in der beruflichen Netzwerkkommunikation. Eine Professionalisierung zeigt sich (1) im gezielten Umgang mit den durch die Kommunikation erzeugten Wissensinhalten, (2) in der funktionalen Integration verschiedener Medien, (3) in vielfältigen Formen der Inszenierung von Online-Aktivitäten, (4) in einer an die Strukturbedingungen der Netzwelt angepassten Pflege der Arbeitsbeziehungen bzw. ritualisierten Beziehungsarbeiten. Spannend ist die Gegenüberstellung dieser Beiträge auch deshalb, weil sich mit den sozialen Praktiken der Selbstthematisierung und Inszenierung im Internet die Eindeutigkeit der Trennung zwischen Beruf & Erwerbsarbeit einerseits und privater Sphäre andererseits nur noch sehr bedingt aufrechterhalten lässt. Noch gar nicht angesprochen sind mit diesem kurzen Abriss Beiträge, die sich mit dem komplexen Verhältnis von Realperson und Agent bzw. Spielfigur, mit Online-Spielen als sozialen bzw. technisch konstruierten Räumen befassen. Jan und ich haben gemeinsam unseren Beitrag die soziale Praxis der Prodnutzung von Content, Code und Metadaten als Wissenstypen im Internet verfasst und beim Schreiben intensiv dazu debattiert – hat großen Spaß gemacht. Ich finde wirklich faszinierend, wie sich mit Weblogs, Wikiwebs, der Verschlagwortung und Beschreibung mit tags neuartige Formen der Wissensoganisation etablieren, die sich aus aus älteren Betriebssystemen bekannten Schema hierarchisch gestaffelten Ordnern lösen und eine neue, lebensweltlich fundierte Praxis individueller und kollektiver Wissensorganisation etabliert, die individuelle und kollektive Wissensvorräte vorteilhaft miteinander kombinieren; interessanterweise setzt sich diese Form Wissensorganisation auch bei Objekten durch, die gar nicht im Internet liegen, wie z.B. bei Librarything für Bücher und Qype für Orte. Welcome to sozlog, a private homepage by Tina Guenther. Please feel invited to check out my ClaimID, take a look at my bookshelf at Librarything or follow me on Friendfeed (sozlog) or via Posterous. You would like to contact me? Just send me an E-Mail. Heitere Postkarten – ePost und De-Mail für mehr Vertrauen im Netz? Sozlog ist ein privates publizistisches Angebot von: Dr. Tina Guenther, Weiermannsbuschweg 7, 40822 Mettmann (verantwortlich nach § 5 TMG). Sämtliche Beiträge geben ausschließlich die Auffassung des jeweiligen Verfassers wieder. Dies gilt insbesondere für die mittels der Kommentar-Funktion erstellten Diskussions-Beiträge. Die Betreiberin behält sich die Löschung einzelner Beiträge und die Sperrung der Kommentar-Funktion vor. Die Inhalte dieses Weblogs sind mit einer Creative Commons Lizenz geschützt. Gemäß § 28 BDSG widerspreche ich jeder kommerziellen Verwendung und Weitergabe meiner Daten.